When I was a brand new birder in 1975, I treasured my field guides, but wanted to study actual birds more than pictures. I spent as much time as I could outside looking at living, breathing birds, but whenever Russ and I went to Chicago, I also spent an hour or two at the Field Museum of Natural History, scrutinizing the displays. It never occurred to me that maybe I could talk to anyone who worked there and see specimens that weren't on public exhibit—I was way too shy to imagine that. It was only later that I started meeting museum people at scientific meetings, and as it turns out, I would have been more than welcomed in the actual collection area. When I was a teacher in Madison, Wisconsin, I spent a lot of time at the University biology museum. When my students or I salvaged birds on roadsides or under windows, we always brought them to the museum. In a few cases, Frank Iwen, the curator of birds, authorized us to prepare the study specimens ourselves in class. Two or three times a year, I’d arrange a field trip to the museum so the kids could see “their” specimens. As a young mother, I brought my own children to the Bell Museum of Natural History in the Twin Cities. That’s where my four-year-old daughter Katie broke down sobbing when she learned she would never ever be able to see a living, breathing bird like the beautiful rosy birds in the Passenger Pigeon display case. Her response to that was one of the things that fueled my passion to prevent other species from the same tragic fate. 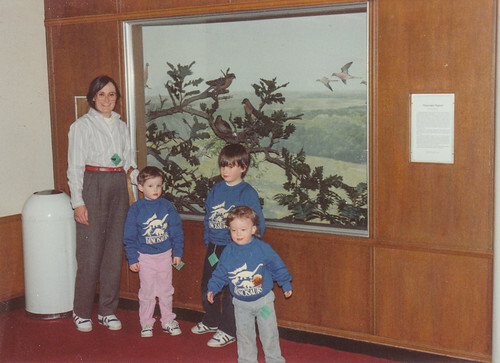 Me, my daughter Katie, and my boys Joey and Tommy, at the Passenger Pigeon exhibit at the Bell Museum in 1988. Katie wanted Russ to take the photo, but decided to look her saddest and angriest because of the tragic plight of this species. I spent so many years of my life desperately trying to keep injured birds alive when I was a rehabber that many people are surprised to learn how strongly I support museum work. But what we learned about eggshell thinning due to DDT came from a museum study by Joseph Hickey. Analyzing feathers from loons collected in different places and different times is telling us about the growing levels of mercury in various aquatic environments. During the huge Great Gray Owl invasion of 2004-2005, a large number of these magnificent birds were found dead or dying. The Field Museum salvaged the carcasses and did necropsies to analyze stomach contents and determine causes of death as well as other research on them. Some people think that museums have had their day and now we have more important work to do in conservation. But that is utterly untrue. I admit to being somewhat negative about some “collecting”—that is, shooting birds—for museums except in special cases. But very little collecting still happens except in specific important situations nowadays. 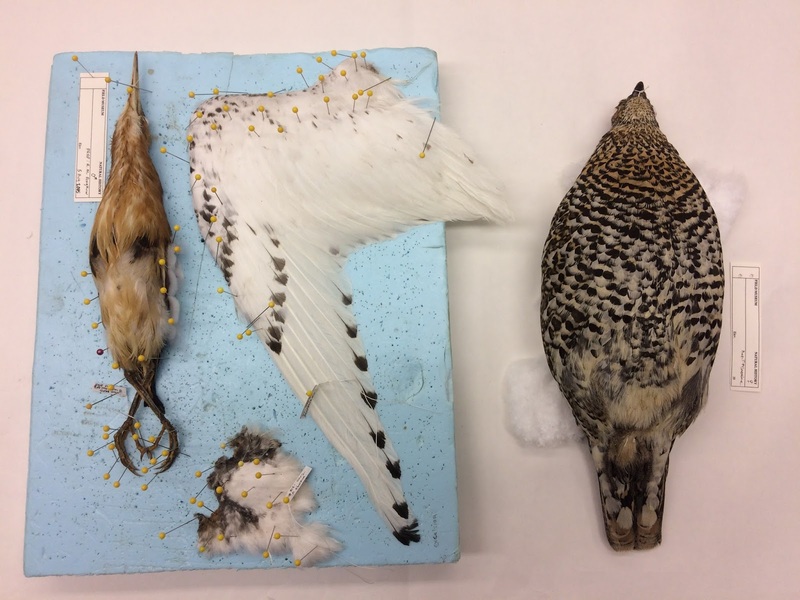 Museum collections are now mostly augmented by salvaging birds that had died anyway, like the ones my students brought to the U of Wisconsin or the owls that were sent to the Field Museum in 2005. Both lice and mites were retrieved from the specimen, and it’s possible those parasites may represent species never before described. The very first Ivory Gull louse ever collected and described for science was way back in 1780. The salvageable parts of this gull that will make it into a museum drawer include one spread wing, the head feathering, and some additional feathers. 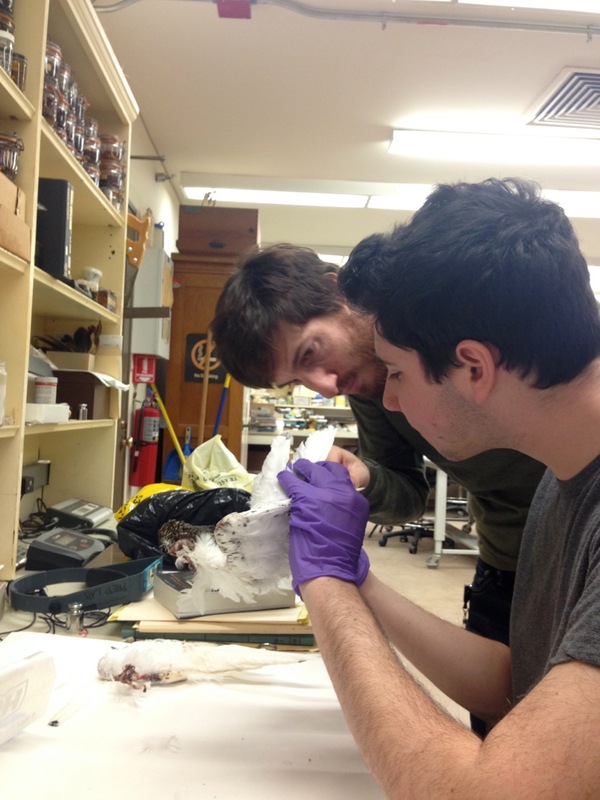 A search of a database of museum bird collections indicates that the tissue sample may be only the second one in any museum collection. The tissue sample will be analyzed for DNA. The specimen will also provide information about mercury loads—an especially important issue. Ivory Gulls are classified as near-threatened by BirdLife International because they have declined dramatically—as much as 80 percent in Canada—over the past 30 years. Tests on museum feather samples of Ivory Gulls indicate that mercury in the species has increased 45-fold in the past 130 years. I am thrilled about having given the specimen to the Field Museum on many counts, particularly because of my affection for the institution, my joy at contributing to science, and my fascination with avian parasites—I am, after all, the person who sent a tapeworm from a nighthawk to Dave Barry. As sad as I am that that poor gull died, I am very happy that its poor mangled body is providing important information for science that may ultimately help other Ivory Gulls. Three specimens drying: Least Bittern, my Ivory Gull, and a road-killed Spruce Grouse salvaged by Nathan Goldberg while he was in northern Minnesota.